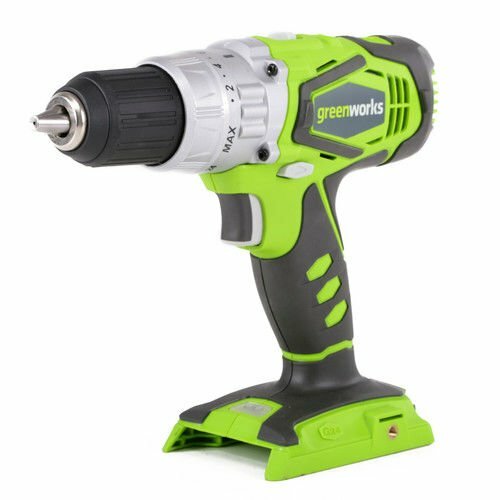 Delivering class leading power and performance, Greenworks' 3700502A 24V Cordless Lithium-Ion 2-Speed 1/2 in. Hammer Drill (Bare Tool) provides up to 2,600 in-lbs. of torque and 3,200 RPM with a Mabuchi motor for maximum power and versatility in a wide range of applications. Powered by a 24V lithium-ion battery (sold separately) and is compatible with both indoor and outdoor tools Includes: 24V Cordless Lithium-Ion 2-Speed 1/2 in. Hammer Drill (Bare Tool) - 3700502A,Bare Tool - Batteries and Charger Sold Separately.